Reading this advice hit me square between the eyes as I realized how much of my energy is focused on being interesting, rather than being interested in the people around me. Isn’t it amazing how much time we can spend trying to create an interesting life, resume, blog post, tweet or story? How often do we stop to be interested in the stories of the people that are closest to us? Giving someone your attention is a rare gift. That’s why it’s so valuable. Novogratz talks about the incredible importance of listening to encouraging economic growth and change in developing countries. Listening is no less important in any country or mission. Stop trying to be interesting. 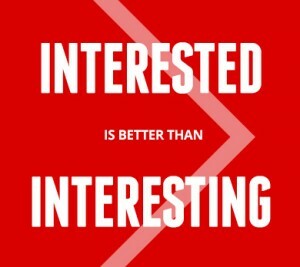 Be interested.